To learn building skills to help with the process, and to give us something in which to learn to sail, we built Bolger's Teal using step-by-step, detailed instructions in Harold "Dynamite" Payson's Instant Boats. We made it over about two months, working most, but not all weekends. We named her Forget-Me-Not. Forget-Me-Not under construction (dust mask for the daughter—safety first!). 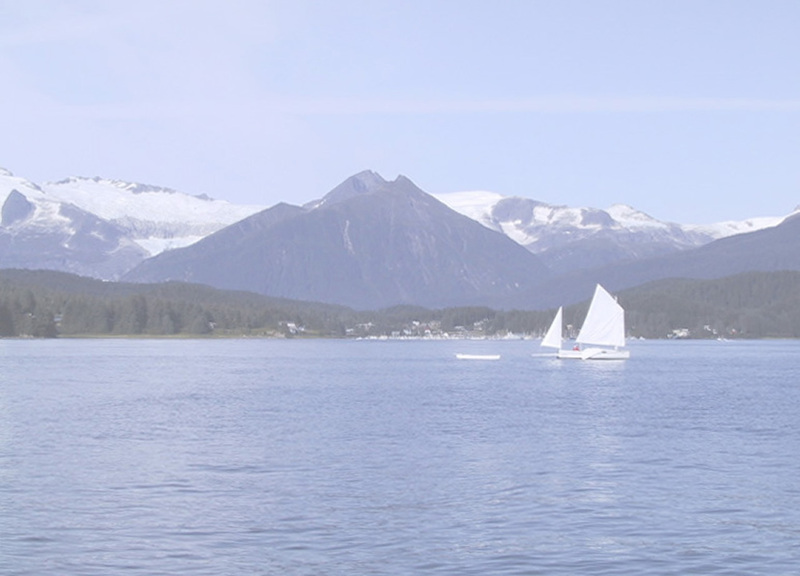 Here's one of our favorite places to sail, Auke Lake. I customized the rowing seat slightly, so that it can be stowed flat and out of the way when not in use. I did this by building it as designed, but leaving the interlocking "leg" pieces loose. I hinged the seat to the longer leg, and added a long T-shaped piece onto which the shorter leg can be slid and secured by friction. Here's how it goes together. Flip it over, and you've got a seat. Thanks to Ed Sasser for the photos.